As I work on a post full of fun photos and information from our weekend trip to Rocky Point Mexico I thought I’d share my favorite beach accessories. If you know me you know I am a beach bunny at heart (from my first trip to Hawaii at age 6). 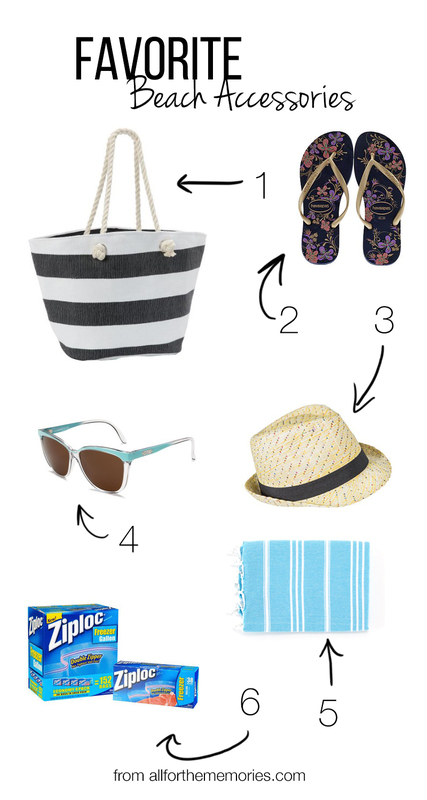 A beach tote is a must and black and white striped has been at the top of my list for a long time. Even better if it’s inexpensive since it’s just going to get sandy and dirty. Havaianas Slim are my go to beach flip flop. The most comfortable rubber flip flops I have found so they are easy to clean. It’s probably rare that you’ll see me at the beach without a fedora. My crazy hair needs a hat. Tip: don’t get discouraged if you try on a couple and they don’t look good. There are huge variances in size and shape so try on several on your next Target run. Inexpensive is again key since it’s possible you’ll leave it or lose it on a beach trip. You will not see me outside without sunglasses. My eyes are sensitive and pupils are huge. Plus everyone should protect their eyes from the sun’s rays, wind and sand. Make sure your glasses aren’t too old (the protection wears off) or scratched. A turkish beach towel is NOT like the normal fluffy (but bulky) beach towels. It’s super light weight, easy to pack and dries quickly. Gallon Ziploc Freezer bags. It might sound weird but you won’t regret throwing a few of these in your beach bag. They’ll keep your phones and cameras dry and sand free (important if you have a DSLR camera) and you can even use your phone through the bag if you’re paranoid. A few extra bags make great seashell and wet clothing storage.